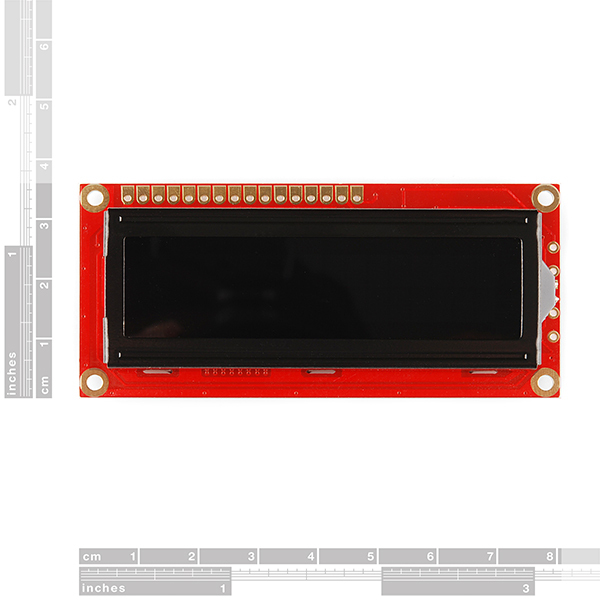 "You will need ~11 general I/O pins to interface to this LCD screen." Only 7 I/O ports are required. Also, to answer Crizo's question, no external resistor is required. There's a 25 ohm resistor on the LCD which does this for you. Just hook it up to Vcc (or through a MOSFET, connected to an 8th I/O port.) I think that this choice is unfortunate, because it eliminates the possibility of more efficient switching regulation. Great LCD and easy to use! 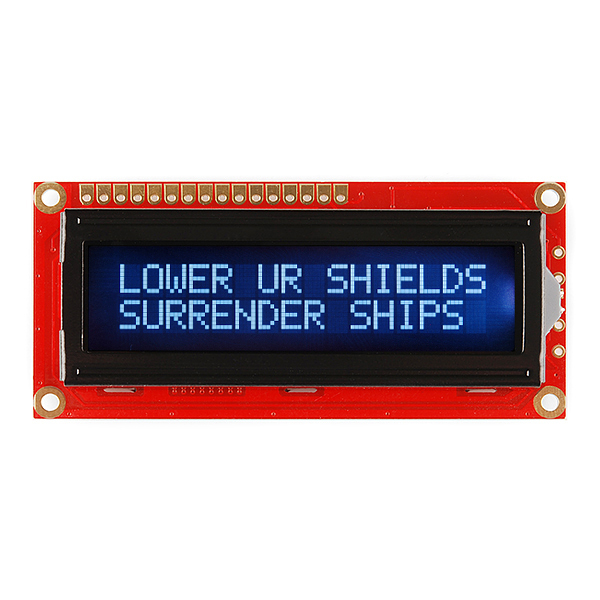 I am trying this display on my Arduino. I hooked up the power and LED light power to the 3.3V, and the data,e,rs,etc lines to the digital outputs. The contrast is done with a poti. I wrote up some testing code that should just print one line, wait a second, clear and print a different line. The funny thing is, the contrast changes dramatically depending on what is being displayed, to the point where I initially thought one line wasn't being printed at all and the other one was. Has anyone had a similar problem with this display? There seems to be a minor error in the ST7066 datasheet. On page 8, the 'Function Set' command shows that DB3 indicates the number of lines (should be set to 1 for this display) and DB2 indicates the font size (should be set to 0 for this display). This is correct and matches the HD44780 spec. However, there is a problem on page 20 in the 4-bit interface example. In the 'Function Set' step, the document is showing these as the second nibble of DB5 and DB4, which correspond to DB1 and DB0 in 8-bit mode. This is wrong. It should be the second nibble of DB7 and DB6, i.e. '0 0 N F 0 0' rather than '0 0 0 0 N F'. They get it right in the 8-bit interface example on page 19. Can someone confirm that I am reading this correctly? I've got this display and I'm attempting to use it in a reverse geocaching puzzlebox. It's attached to a Mini Pro, so the voltages are at the right level, but I can't get the contrast right. I've tried a variety of resistors (10k,15k,22k) in combination with a 10k pot, yet I always have to turn the pot all the way up and the contrast is still poor. Is it just that these 3.3V versions have poor contrast, or is there something else I can try? Just put a ~ 1K resistor between V0 and GND, that should do the trick. I was strugling with the contrast too, following the datasheet and putting two 10K resistors between V+ - V0 - GND. That will give you very poor contrast indeed. 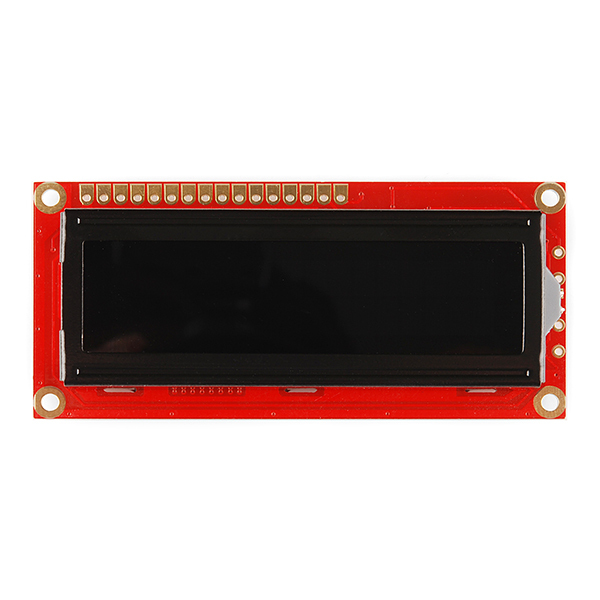 This a great little LCD and looks a lot cooler than the boring black on green flavor LCDs. And it runs on 3.3V (great for us PIC32 users). Aha! This is the ST7066-0A version, which includes English and Japanese characters. Make sure you look at the character set specified on page 10 of the ST7066 data sheet and not page 11. The latter character set is the English/European version (for the ST7066-0B). It's too bad really, the second set has all the french characters I needed on top of a ton of other fun characters such ?, ?, ?, and so on. 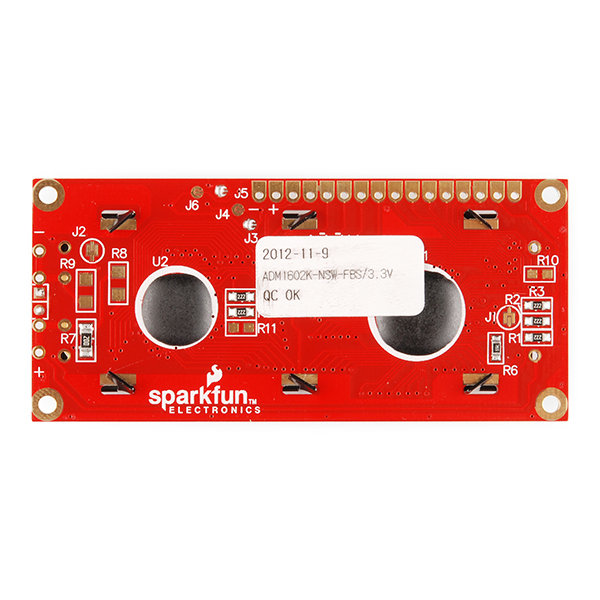 Up to now, I connected both power pins and led backlight to 3.3V (following the datasheet)? but I'm wondering what is the output voltage of arduino pins. 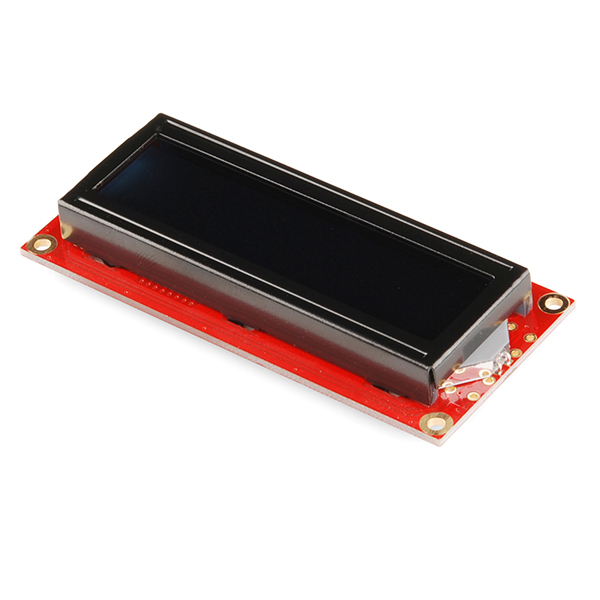 So the question is: can I use a 3.3V lcd display with an arduino or shall I use 5V displays only? By the way, can I replace the potentiometer between Vss and V0 by a 15k resistor? "Each of the 14 digital pins on the Pro can be used as an input or output ... They operate at 3.3 volts." (again, emphasis mine). The above bit for Pro doesn't mention if it's 5V for the 5V version, but if you're using the 3.3V version of the Pro, it stands to reason that it will at least run its digital I/O pins at 3.3V instead of stepping it up to 5V. I hope this helps, and didn't come too late. Normally we work with 5V versions, as most microcontrollers also use this voltage, any idea what the max input Voltage is for the 3.3 v version? Maybe I'm missing it on the datasheet, but I can't find the backlight voltage or current specifications for the 3.3v versions. I'm trying to calculate the current limiting resistor value. Also I'm curious to know how consistent the contrast-voltage-to-actual-contrast ratio is so I'll share that my LCD screen works close to best with a 0V - 820â¦ - Vcontrast - 3300â¦ - 3.3V voltage divider setup. Also also, when Sparkfun says you'll "need ~11 general I/O pins to interface to this LCD screen" that doesn't account for the fact that you mostly don't need to "read" data from an LCD display and that it works fine for everything I've tried it out with in 4-bit mode, so you really only need Register Select (R/S pin 4), Enable Clock (E pin 6), and Data 4-7 (pin 11, 12, 13, 14), with Read/Write pin 5 driven to ground which adds up to 6 pins, 8 including ground and 3.3V. I've found it quite useful that it can be run entirely over a spare ethernet (8P8C RJ-45 tested with Cat5e) cable with the proper breakout boards. It's really nice to be able to use an LCD display with lower-voltage development boards with no hassle about signal levels. Though I prefer to power my displays from a separate rail, it's no big deal, since the low-voltage boards usually run off 5V anyway. Thank you for offering a 3V version of this classic visual output device!